(5 June - Cropchoice News) -- Monsanto's lawsuit against Saskatchewan canola farmer Percy Schmeiser opened today in Canadian Federal Court. 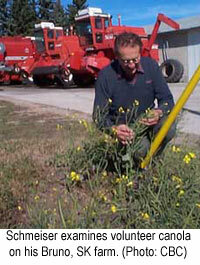 At issue is canola Schmeiser planted in 1998. Monsanto alleges the farmer illegally used Roundup Ready seed. Schmeiser says he didn't ask for the Roundup - it came to him. According to his defense, it is a case of contamination from nearby fields where biotech seeds were planted. Schmeiser says he would "'rather be fishing with my grandkids," than defending himself against Monsanto's legal attack. The suit is costing Schmeiser and his wife dearly, "Everything that we've worked for and saved for in our lives we're spending on legal fees." To pay the fees, 69 year old Schmeiser is still farming, planting 1350 acres of wheat, oats, and - yes - canola this year. Monsanto says Schmeiser infringed on its patents. The company is asking the court to stop Schmeiser from planting any more saved seed that contains Roundup Ready and wants Schmeiser to pay $10.17 per acre - the tech fee - for the 1998 crop, plus court costs and interest. Schmeiser, in his defense, says it was contamination and questions whether Monsanto should have been allowed to obtain a patent on canola seeds in the first place, saying "...my grandfather came to this country to be free, and all of a sudden we have a multinational trying to exercise more control over farmers than governments would even dare to think of." It is likely to be weeks, or even months, before the court announces a decision. Since Roundup Ready and other biotech crops came on the market, Monsanto has investigated and sent lawyers after hundreds of US and Canadian farmers alleging violations of its technology rights. Almost all farmers the company has accused have opted to settle out of court, making five and six figure payments to Monsanto and signing settlements that prohibit their talking about the experience. But Schmeiser hasn't buckled under the pressure. Not only is he defending himself against Monsanto's charges; but he's filed a countersuit asking for nearly $7 million. See the Canadian Broadcasting Corporation's story on the Schmeiser case at http://tv.cbc.ca/national/pgminfo/canola/index.html.